Sometimes I'll be walking through a part of the garden, I'll stop, look, and immediately see how to improve things. I'll know what my next project is. The new Wattle Woods path popped into my head like this. Hey presto! The interior of the Wattle Woods was a mess. But right along the fence-line my wriggling stream was running again, and I kept wanting to check it. So instead of going around in a large loop, I decided to create a new path right through the middle. Easy! Out came two oversized Fountain grasses - they're extremely obliging, having shallow roots that my shovel can slice easily through - and a head-high seedling Prunus tree. 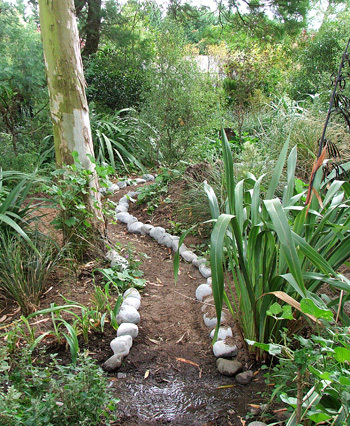 Within a half an hour the route of the path was obvious - it would curve around a flax, between a couple of Pittosporums, and reach the stream edge. Easy, again! I dug the path level and placed river stones along the edges. All paths need purpose - having a destination is a good design idea. 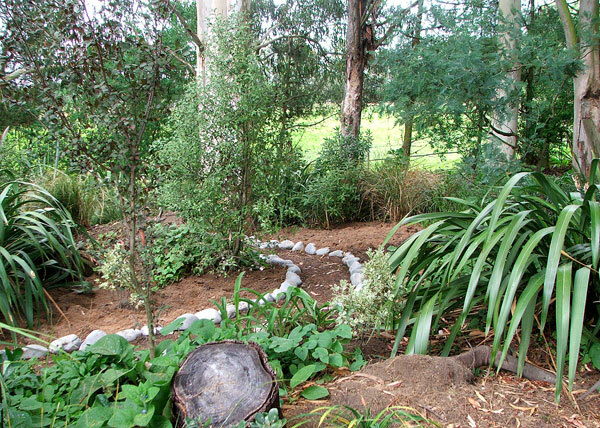 My final gardening session saw the path push past an uprooted Wattle stump, over the little stream (no bridge required), and join the existing fence-line path. Easy, again! I've turned a shapeless mess of scruffy soil into a shapely piece of garden. There are flaxes still to plant, and I'll need to apply compost, manure, and mulch. But these are mere details, and again extremely easy to accomplish.